I'm still in a state of shock that it really happened. Even now, in many ways it seems like just a dream. Yet, sure enough, I spent all day at the White House at 1600 Pennsylvania Avenue in Washington, DC, taking in first-hand the grandeur of this classic annual national holiday celebration tradition. To brighten your Holiday Season, it gives me no greater pleasure to share this extraordinary and memorable behind-the-scenes day at the White House with all of you. Being hosted by the White House Obama Administration for this once-in-a-lifetime event was a real privilege, especially considering that out of thousands of perspective invitees I was one of just 17 women active in social media selected to attend. 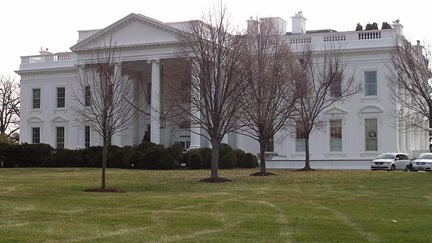 Thanks so much to the White House staff for truly rolling the red carpet out for our small group. My deep appreciation also goes to Social Moms for helping with my traveling expenses to make this whirlwind trip of a lifetime possible. How honored I am to represent the biggest social media community for moms online at such a prestigious venue. For sure, readers, you're not going to want to miss this exclusive additional post published on SocialMoms shortly after my visit with lots more photos. 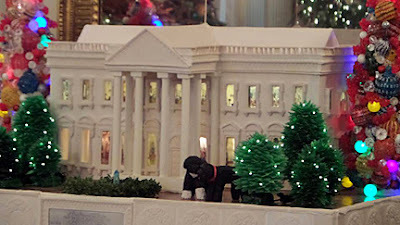 My first post in this #WHHoliday series showcases First Dogs Bo and Sunny Obama, who's presence is everywhere among the White House holiday decor this year. How I would have loved to have gotten to pet the two doggy Presidential Family members in person (or I should say DIRL, Dogs In Real Life). I didn't get to meet the original Bo or Sunny duo for good reason, though. As it turned out they were out with First Lady Michelle Obama in the community doing more important things yesterday -- visiting sick kids and spreading holiday cheer at Washington, DC's Children's National Hospital . In fact, watch this video of Mrs. Obama with both pets, sweetly reading Twas the Night Before Christmas to the Children that day... seeing this will likely warm your heart and make you smile, too. Meanwhile back at the White House, my activity-filled day began with a chance to stroll through all the beautifully decorated rooms on the lower floor of what is also known as The People's House. The East Garden Room was among my favorite stops along the private guided tour we received led by Kasie Coccaro, White House Associate Director of Online Outreach and Operations for the Office of Digital Strategy. I guess the main reason I like this best is because not only am I a huge dog lover, I've always been particularly enthralled by the four-legged canines that have lived in the White House since I was just a little girl. 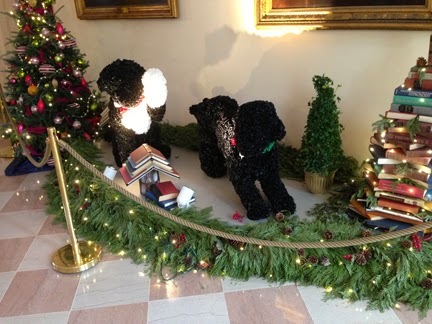 Here in the East Garden Room likenesses of Bo and Sunny were recreated as lifesize sculptures completely covered with white handmade black and white satin ribbon rosettes to replicate the curly fur on these lovable Presidential Family Portuguese Water Dogs. To add yet another dimension of reality, small electrical motors were added to each of the playful canines. Look really closely at these gentle giants and you'll see both his and her Bo Ho Ho Red Boutonnière and Corsage decorative collars. In fact, we learned how to make these during the day, so watch for another MBE post later this week with step-by-step directions to reproduce the same whimsical accessories at home for you and your own pet. In this short video I created above, notice how realistic the ribbon technique makes these dogs look and watch these two giant love muffins' tails actually wagging! Another highpoint on the White House holiday tour was visiting the State Dining Room where so many important Presidential social functions and meals are held. 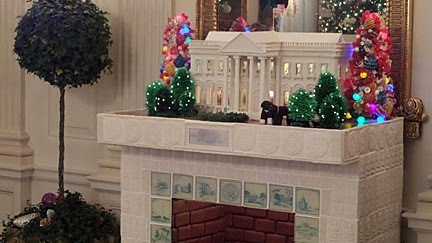 In the images below you can get both a full view and a close-up peek of the full-size fireplace made completely of Gingerbread, along with a cookie version of the White House perched on top on the mantel, designed and executed by the President's talented pastry chef staff. Down to the most minute detail, this pastry masterpiece is the most beautiful gingerbread house I've ever seen in my humble opinion as a novice at-home gingerbread baker and builder. If you love gingerbread making as much as I do, you'll really enjoy the White House time-lapsed video showing how the entire edible fireplace and mantel was made. 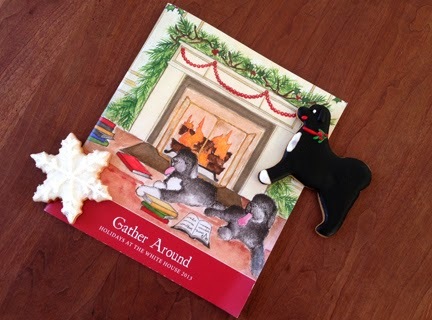 Bo and Sunny really are the stars of the 2013 Gather Around White House Holiday Tour Book that I received, too. 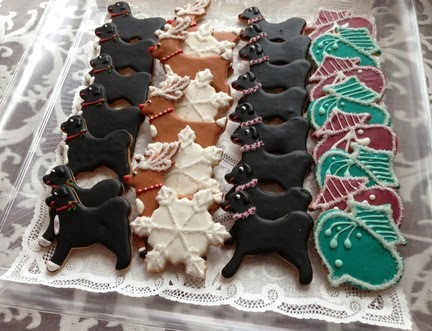 The White House -- busiest bakers on the planet, I assume -- also indulged us with intricately designed cookies of two of the world's most famous dogs along with various holiday icons. That's just the tip of the iceberg of what I saw and experienced at the White House in the space of a day. 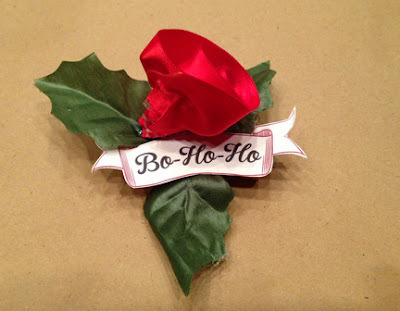 Throughout the holiday season, watch for more posts here on MommyBlogExpert about this memorable opportunity. Also, for more on my experience as well as additional images, check out the story I wrote for the SocialMoms. 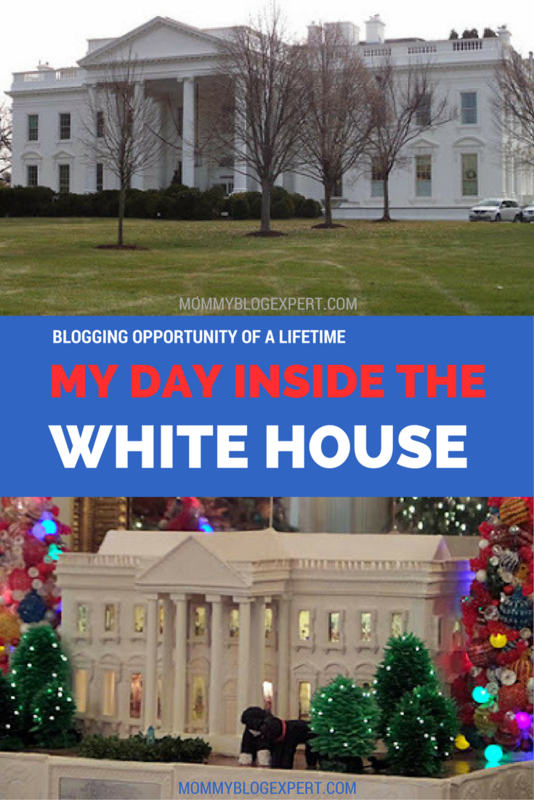 Also - You won't miss a thing if you follow MommyBlogExpert and the hashtags #WHHoliday and #SocialMoms to share completely in my Holiday White House in Washington, DC experience as the story unfolds. 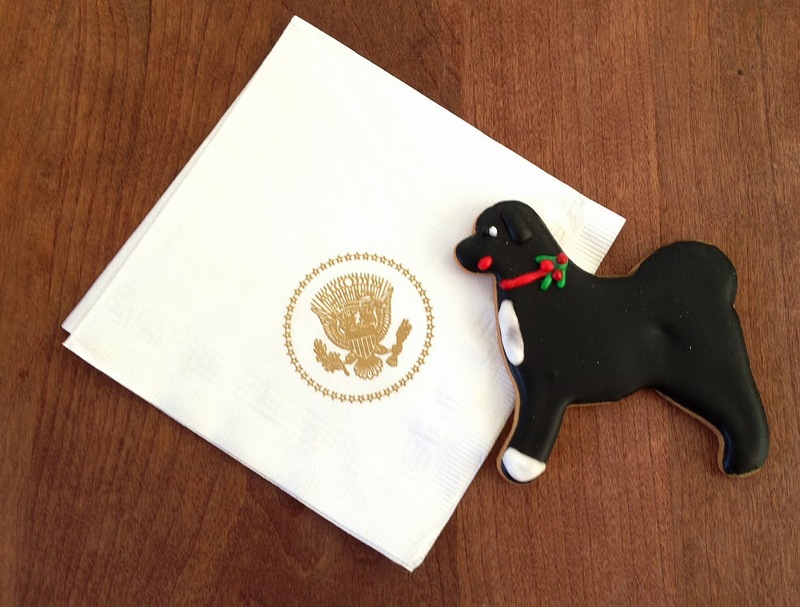 FTC Disclosure: I attended the #WHHoliday Social as a guest of the White House and received the official White House Holiday tour book, refreshments, and a gift box of holiday goodies to take home. 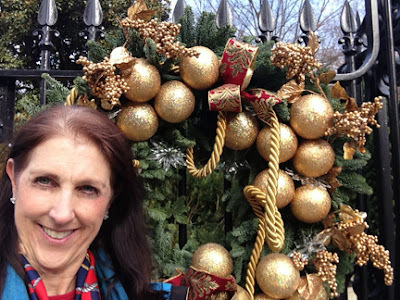 My travel to Washington, DC was made possible in part through Social Moms. However, opinions and thoughts are my own. See complete FTC Disclosure information that appears at the bottom of MommyBlogExpert's main page and at the bottom of every individual post on this blog, including this one.